In a major Sunday editorial – “How to Inoculate Against Anti-Vaxxers” (1/20/2019)– The New York Times endorsed coercive government measures to enforce compliance with mandated children’s vaccination schedules. The U.S. government- dictated childhood vaccination policy is under the direct influence of the pharmaceutical industry. Indeed, in 1986, under the National Vaccine Childhood Injury Act (NVCI) this industry was given government immunity from any liability for vaccine-caused harm to children. If there was no potential risk of harm, why would the government indemnify manufacturers? If vaccines were perfectly safe and effective immunizations against infectious diseases,why did the Special Master of the “Vaccine Court” determine that some children had been irreversibly harm by mandated vaccines and authorize payment of $4,000,000,000 (Billion) in compensation ? If vaccines posed no risks, why would an increasing number of (mostly) well-educated parents choose not to vaccinate against some of the mandated vaccines? 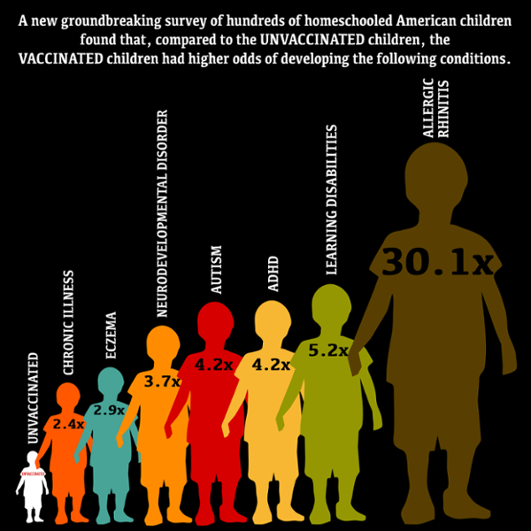 To gain the trust of responsible, intelligent parents, vaccine safety data must be disclosed for independent analysis, rather than locked in secrecy by both manufacturers and the CDC whose pronouncements are belied by empirical evidence –i.e., the exponential increase in autism spectrum disorder (ASD) in children, which the American Academy of Pediatrics (AAP) acknowledges affects 1 in 40 children in the U.S. The aggressive drive to enforce compulsory vaccination is a throwback to the sordid legacy of Eugenics – i.e., social Darwinism* — when the U.S. government enacted state laws that violated fundamental human rights. They did so, in a misguided quest to control procreation for the purpose of creating a master race, free of disease and of all “undesirables”. It is well to remember that the academic, medical, and legal establishment in the United States fervently embraced the faith-based, elitist pseudoscience of eugenics, which led to the enactment of sterilization laws in 32 states. As a result, 60,000 American citizens were sterilized against their will. This medical travesty was “justified” by public health officials and the complicit medical community with the claim that it was “for the public good”. These U.S sterilization laws served as the blueprint for Nazi Germany’s mass sterilization policy. California, whom the Times’ editorial board lauds for having “eliminated nonmedical exemptions for mandatory vaccinations“, has the odious historical distinction of leading this country in the number of sterilization procedures performed on men and women without their consent, and often without their knowledge. In 2016, PBS [Public Broadcasting System] cited an article from the Center for Investigative Reporting that revealed that California prisons had authorized sterilizations of nearly 150 women inmates between 2006 and 2010. The state paid doctors $147,460 to perform tubal ligations that former inmates say were done under coercion. The Times’ endorsement of coercive government measures to enforce a dubious public health policy, is an endorsement once again, of an immoral public health policy that invokes “science” to legitimize a morally indefensible policy. This mindset leads the nation down a slippery slope whose destination ends in unmitigated evil. During the heyday of eugenics, the target population was adults of child bearing age; the target population of forced vaccination are infants and young children. The human right to informed consent for medical procedures is the bedrock of moral medicine and U.S. law. That ethical principle was enshrined in the Nuremberg Code at the conclusion of the Nazi Doctors’ trial. It particularly troubling that the Board of Directors of The New York Times is actively promoting draconian government measures to deny parents the right to exercise their parental right to make an informed judgment on behalf of their children — as is their moral and legal responsibility. The Supreme Court has ruled that vaccines are “unavoidably unsafe” products. Congress enacted the National Childhood Vaccine Injury Act in 1986 protecting manufacturers from liability for harm. Under the National Vaccine Injury Compensation Program, vaccine injured children (and recently adults as well) have been awarded approximately $4 billion as of December 2018. These are not “easily refutable” facts. Parents’ concerns about vaccine safety are based on empirical evidence; they have the right and obligation to protect their children from documented, potential risks of harm. The endorsement of dictatorial government measures befits a fascist regime, not a democracy. Secondly, what is currently at issue is both freedom of choice and freedom of speech, and this is a dangerous combination. It is coming that we may not either criticise these liability free products or the lobby that produces them. Nor may we refuse the products. And this is entirely unreasonable – they are being placed on a pedestal, yet there are hundreds of things that can go wrong both singly and in combination (with the certainty that all or anything will be denied in advance as in this editorial). Furthermore, the industry has hundred of more products in the pipeline, which in turn can and will mandated for our children. The industry needs this debate kicked into oblivion because it cannot stand scrutiny. There is nothing in the history of either medicine or the pharmaceutical industry which suggests that this is a safe or wise way to proceed, not is it as if all doctors or medical scientists are in agreement about it. Posted by Vera Sharav | Monday, January 21, 2019 |	Categorized Eugenics / Bioethics, Vaccine mandates. Vera Sharav. Bookmark the permalink.